Below you can view all the homes for sale in the Heritage subdivision located in Wake Forest North Carolina. 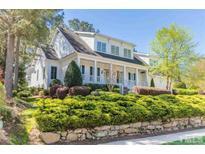 Listings in Heritage are updated daily from data we receive from the Raleigh multiple listing service. To learn more about any of these homes or to receive custom notifications when a new property is listed for sale in Heritage, give us a call at 919-230-8729. Mins from numerous restaurants, retail, grocery, fitness & recreation facilities and all 3 Wake Cty schools!! ! MLS#2247854. 2831. You'll love all the extras this gorgeous home boasts such as beautiful flooring, 1st floor master with walk-in shower, huge kitchen and downstairs office. MLS#2248184. 1127. .This home is well loved & it shows! MLS#2247616. 1758. You don't want to miss! MLS#2244424. 3300. Walk to Gateway Commons shopping Center. MLS#2245759. 990. The second and third floors offer four bedrooms and a unique bonus unfinished walk up attic with plumbing ready for an additional bathroom. MLS#2247261. 3359. First floor master, granite, stainless, hardwoods. MLS#2247133. 1127. In the evenings, you can relax on the beautiful custom paved patio with fire pit overlooking a private, fenced-in back yard. MLS#2247012. 1127. This ideal lot has well-maintained landscaping and a screened-in back patio that is perfect for enjoying a glass of sweet tea! MLS#2245176. 5191. Large bonus room above 2-car garage with a walk in attic. MLS#2246391. 1127. 1st floor bedroom with full bath ; great size family room w/Fireplace & gorgeous coffered ceilings, sunny Dining area open to fabulous kitchen w/granite/Stainless Steel/gas cooktop ; 3 spacious bedrooms and bonus on 2nd floor; hardwood floors/crown molding/plantation shutters throughout main level. MLS#2245606. 4260. Walk to trails, pool, and fishing pond. Must See. MLS#2246506. 4268. Private backyard has bluestone patio & stone wall. MLS#2246104. 649. Plus the smith creek greenway is a great open space nearby as well! MLS#2246209. 4428. Conveniently located w/ walkability to restaurants. Close to shopping & medical provide. MLS#2245350. 2831. Relax on the screened porch or patio. Fenced back yard. MLS#2245375. 513. Convenient to grocery stores, shopping, and much more! MLS#2245023. 297. Minutes to 401, golf, shopping, dining, fishing pond, tennis, gym, walking trails. Booming location! MLS#2244457. 1128. Spacious Bonus Room, flexible loft, tnkls water heater, quartz Kitchen tops, 2 fireplaces, walk-in pantry, screen porch, & more! MLS#2244782. 3789. Short distance from downtown Wake Forest and shopping areas. MLS#2244661. 238. Spacious master suite, new paint & carpet, upgraded fixtures, hardwoods down & rear storage finish your townhome. Bring your buyers! MLS#2244092. 1127. Walk in storage space could be finished! Immaculate. Your dream home awaits! ! MLS#2242966. 4260. 1st floor master & guest bedrooms on 1st floor. A must see! ! MLS#2243523. 1127. Host family and friends in pure luxury and entertain in style. MLS#2241481. 5026. Live the good life in Heritage Manor. MLS#2242397. 5218.